I have read some very varied reviews of this book. Some found it side-splittingly funny while others saw it as a shameless depiction of all that is worst about illegal immigration and bogus marriage. For my part, I had been looking forward to reading it, intrigued by that strange title, so I was delighted to find it on the book table at a U3A meeting. It is the story of Pappa, who shocks his two daughters, Nadia (the story-teller) and Vera, by falling in love with and marrying a glamorous Ukrainian divorcee with "superior Botticellian breasts". The daughters, who had been estranged for years after falling out over their mother's will, find themselves somewhat unwillingly reunited in a bid to save their father from himself - and from the voluptuous Valentina. Valentina is a certainly a character - and even while acknowledging that this could, indeed, be seen as a tale of oppression and victimisation, I have to say that I found it very funny. 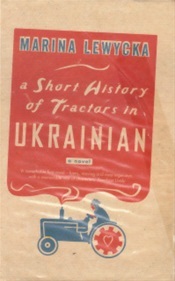 Add to the mix a cast of other, equally large as life characters and you have a rich pudding of a book with the eccentric Pappa (author of The Short History of Tractors in Ukrainian) at its centre. Alongside the humour, there is poignancy, too, in the relationship between the two sisters as they seek to rescue their father from Valentina's ample embrace. They discover, along the way, how the events of their early lives - so starkly different - have shaped their outlooks on life. Vera is the War Baby, born in conflict, experiencing unspeakable horrors in a war-time labour camp. Nadia is the Peace Baby, born in a country of kindness and free cod liver oil. I loved the passages towards the end of the novel which explained what, and where and why. The author, Marina Lewycka, is a Ukrainian, born in a refugee camp in Kiel, who grew up in England and I wondered how much of her own parents' history she wove into her story. In short, I found this an extremely readable, very funny, enjoyable book which made me laugh and cry. I just loved the ending which was one of those uplifting conclusions which makes you smile for the rest of the day as you think of it. Perfect! I read this when it first came out - like you I found it funny and sad in equal measure. Well written. I met her in France - an unusual lady to say the least!